Sarah Caskey: Photo: David ThomasBangor University student, Sarah Caskey, 23, was the first woman to cross the finish line at the Twin Piers 10k race at Llandudno recently. Sarah, a first year undergraduate student at the School of Sport, Health and Exercise Sciences, emerged victorious, completing the course in 39 minutes and 32 seconds. After graduating Sarah hopes to become either a PE teacher or physiotherapist. 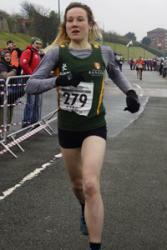 A keen runner, she also came second in the Conwy Half Marathon last year. Back home in Peterborough, Sarah also runs for the Peterborough Athletics Club and Yaxley Road Runners.